Relationships are hard, and at times confusing. Often we question what's right, or even who is right for us, especially when lingering feelings are involved. For Will Henry (Jemaine Clement) things have become very complicated indeed. On their twin daughter's 5th birthday, he catches his longtime girlfriend Charlie (Stephanie Allynne) cheating on him with the least likely suspect, overweight Off-Broadway monologist Gary (Michael Chernus). She coldly informs him she's leaving him. Her reasons are vague, but it's something to do with his lack of attentiveness to her needs. Yet we're never given much reason as to why she'd choose Gary over Will. Nevertheless, we jump forward a year and Charlie has moved in with Gary while Will is still struggling to get over the breakup. He's a comic artist teaching a graphic novel class, but balances his free time between working on his book and taking care of his adorable daughters (Aundrea and Gia Gadsby). His book is shown in bits and pieces with the primary characters resembling people from his life. He attempts to diffuse the similarities while in class by pointing to a power point presentation showing René Magritte famous painting called The Treachery of Images. 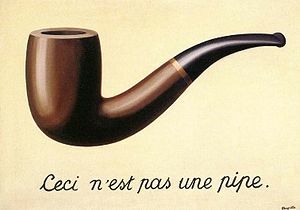 It shows a pipe with the words, "this is not a pipe" in French beneath it. The point being that the image is not reality. It is a representation of a thing and not the thing itself. Yet in Will's case we know better. His images are very real emotional responses to events in his life. They show him and his wife standing apart building a brick wall between them. Yet a comical discussion of his pain with his class leads to an opportunity to meet someone new. She's Diane (Regina Hall) the mother of one of his students. She's a college professor and a single parent giving them similar life experience. Her daughter Kat (Jessica Williams) is an aspiring graphic novelist and respects him despite his sad sardonic ways. The introduction is humorously awkward, yet they do manage to make an impression on each other. Meanwhile, Will starts taking a more active role in his children's lives. As Charlie needs more time to focus on other things. 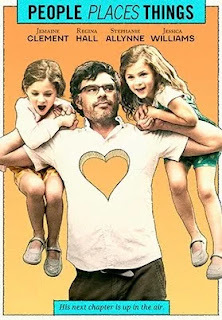 The film is at it's most light-hearted fun when Will is spending time with his daughters. The whole film has a slight meandering quality to it, and Jemaine Clement has the uncanny ability to make scenes feel adlibbed (whether or not they actually are). These moments with the twins are some of the best examples of this. His dry, witty, sardonic sense of humor does give the character, and indeed the film as a whole, a charming, endearing quality. Yet the more time he spends with his kids, the more respect Charlie starts to have for him, even if his blunders are a bit frustrating. There is an earnestness to be good parents on both sides. As things start to heat up between Will and Diane, Charlie starts to question her decision to leave him. There is inevitably always going to be a bond between parents whether or not they stay together. The question for both of them is what exactly that bond means, and are they ok with being apart. However, to complicate matters, Gary and Charlie are planning to get married much to Will's disgust considering her refusal to marry him when they were dating. I like Jemaine Clement quite a lot. He's known for his comedies like "Flight of the Conchords" and "What We Do in the Shadows," but rarely is he in a film that deals more in the emotional complexities of adult life. Here's he's a comical sad sack delivering lines in his trademark sheepish way, but sadly he's not given opportunity to do much of anything else. He doesn't quite wallow in depression, nor does he necessarily find the needed closure to bring him out of his sadness. Yet there's something endearing about his performance. We do root for him. Partly because he's a good father, and a nice guy. I only wish there would have been another layer. Diane is both lovely and charming in her own right. We sympathize with her, as does Will, who understands her lonesomeness all too well. It's a credit to Regina Hall that she makes Diane so likable with a relatively small amount of screen time. In fact, it becomes something of a frustration that Will doesn't just realize how much better she is than Charlie. Yet that's ultimately the point. Relationships are complicated. Long term relationships, especially when there are kids involved are not easily forgotten. While Charlie and Will remain friends, their sarcastic quips hint at the unresolved emotions between them. It's graphic novel artistry is disappointingly never allowed to become full blown whimsy. Rather it exists as a mere images we're occasionally allowed to linger on. They don't, however, become anything more. Worse yet, the climax and ending feel rushed and lackluster. It builds in dramatic tension, but fizzles rather than sparks to life. It's a shame when considering the depth of difficulty faced by the protagonist. Rather than making any meaningful revelations, Will settles for making the best of the situation. Even if the point of the film is Will's coming to terms with the state of his broken family, it felt like it had evolved into a new romance. As such, Will (and the audience) deserved to see more of that play out. Yet despite these things, I found myself enjoying enough of this film to forgive many of its shortcomings. All the characters are, for the most part, good, relatable people, and that allows the film to remain endearing throughout. With just his 3rd feature film writer/director James C. Strouse has put together a story of enjoyable, subtle, understated, dry humor that is the stuff of good indie dramedies. Clement is a likable father figure, and his scenes that show a budding relationship with Regina Hall's character work well as they are. Yet it will, for most, be down to whether you can enjoy its sense of humor or not. For me, it's right up my alley.